Try our delightful products on bagels or toast, use them in desserts, as an ice cream topping, or spread on crackers for a pleasing snack. They make wonderful gifts for all ages and many occasions! We specialize in providing a product that is attractive and of highest quality. We do not add artificial colors; the colors you see are the natural color of the fruit. Instead of using high fructose corn syrup, we use pure cane sugar. 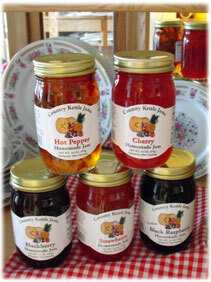 Our “no sugar added” jams and jellies are also unique in that we don’t use artificial sweetener. Instead we use de-ionized white grape juice concentrate as our sweetener, which is very appealing. Our slow-simmered butters are superb in flavor. On this site you can find information about the jams and jellies we offer, along with an order form for any of our products. We do not have a retail location. Our business is primarily wholesale and mail orders, shipping nationwide to businesses and private customers. © 2009-2019 Country Kettle Jams. All rights reserved.